Aside from garment factories and tobacco factory, Mongkok was also once home to a metal factory by the name of Po Yuen Iron Works, founded by Fok Wai-man (霍恵民). The factory was located at 19 Sham Chun Street near the Mongkok Market from the 1940s through the 1960s. By the 1990s, the firm’s address was listed as Ground Floor of 11 Cheung Wong Road in Mongkok. According to listings and ads in directories, the firm specialized in wire nails and other metal products and at one point also manufactured metal windows and doors. Outside of running the factory, Fok Wai-man was very involved with the pro-Taipei Kowloon Chamber of Commerce which he served on the board of and went to Japan with fellow KCC director Jong-sau Pun of Hing Wah Battery in 1960. 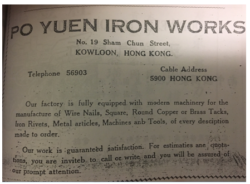 As a firm, Po Yuen Iron Works was incorporated in 1955 and dissolved in 2014. This article was first posted on 5th March 2018.